To the Heart of the Storm. Buy at Amazon. 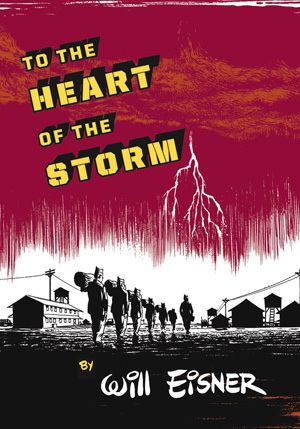 TO THE HEART OF THE STORM (1991) is a compelling, award-winning autobiographical novel about a young man who recalls his life while riding a troop train during World War II; his poverty stricken home life, the anti-Semitism he and his family have faced, the family stories his parents recounted. 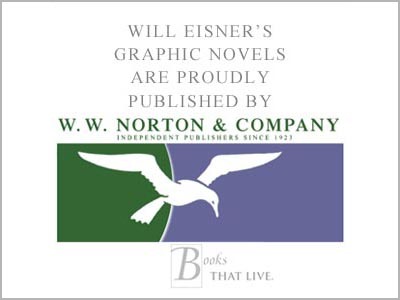 Eisner commented in July, 2000: "I had begun this book with the intention of writing a graphic novel about what I believed to be the "biology of prejudice". Rather than use dry scholarly documentations I thought it would be more interesting to report my own personal experience. About one-third into the book, I realized that I was producing an autobiography. It gave me serious pause, for writing a self-revealing account of one's life takes considerable courage. "It took me a year to produce. At the end it turned out to be a period of deep therapy. I had to deal with untrustworthy memory and the residue of guilt about the fairness and accuracy of the portrayal of loved ones." Widely regarded as Will Eisner’s finest autobiographical work, in which his mastery of storytelling, art and dialogue combine with universal themes to make this his most moving and powerful graphic novel.